El Chorro in Malaga - Getting from Malaga airport to El Chorro. El Chorro is a small village near Alora in the province of Malaga. It’s one of the main tourist attractions in Europe for the rock climbers due to its proximity to the "Desfiladero de los Gaitanes", although it receives loads of visitors every year seeking to practice activities like trekking, mountain biking or camping. Remember than you can hire a car or book a transfer to El Chorro from us, find more information about transport at the bottom of this page. The growth of El Chorro is mainly due to the station, situated in first line of Malaga province’s railway, one of the main commercial capitals in Spain during the 19th century. The coal mine present in Cordoba and the intention of using this coal to supply all the boats and ports of the Mediterranean are the reasons why they wanted to connect Malaga port with Cordoba, as well as transporting everything that was produced by the industry in Malaga towards the peninsula’s interior. The railway society from Malaga to Cordoba decided the construction that is characterised by a craggy and difficult terrain that required advanced engineering to get round the amount of different obstacles: 17 tunnels, 8 viaducts and 18 bridges. The Guadalhorce reservoir is surrounded by 7 municipalities: Carratraca, Ardales, Teba, Campillos, Alora, Abdalajis Valley and Antequera. The reason for the reservoir’s population came from the need of the workers to have their accommodation near work while the ‘presa del Conde’ (the Earl’s dam) was being built. Out of all the existing reservoirs, the first one to be built was El Chorro, finished in 1921, due to the need of supplying electricity and improving the risks of the Guadalhorce basin. A footbridge hanging over the narrow pass of los Gaitanes that was built due to the need to connect two hydroelectric facilities. It was built by fishermen from Malaga who literally had to work hanging to finish such a project of pure engineering that seemed more like a dream than the need of connecting the two dams. The 'king’s path' was built between 1901 and 1905 and connected the El Chorro cliff edge with the Gaitanejo cliff edge, that allowed the workers and building materials to cross from one side to the other. Today the 'king’s path' is unusable due to the lack of maintenance during so many years, although there are plans to recover it in the future, to become once again a place to be able to enjoy one of the most beautiful inland views in Andalusia. A cave church situated in the municipal limits of Ardales, where Omar ibn Hafsun, a rebel descendant of Muladi (Christians converted to Islam) Visigoths, built a fortress during the wars between 880 and 919. The first thing that catches one’s attention of this reservoir is the harmony between the engineering and the natural environment, creating a beautiful site that is well worth a visit. It’s the largest natural area in the province of Malaga and offers some of the most beautiful views in the whole of Andalusia. It belongs to the municipalities of Alora, Ardales and Bobadilla. In the highest areas live the mountain goats while other smaller animals like the blackbird or the swift live in the lower areas, closer to the water. This wonderful 70 kilometre journey can be done in 1 hour by car, although, whether it’s the first time you’re doing this journey or not, we are sure you won’t be able to avoid stopping on the way to take pictures and enjoy the area’s breath-taking views. If you don’t have a vehicle of your own, you can check out our car hire prices at Malaga airport. Malaga airport transfer to El Chorro can be as fast as driving your own vehicle, check our prices for getting to El Chorro. 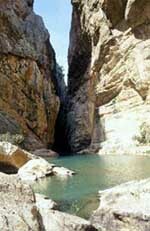 Another option is from Malaga train station from where you must buy a ticket to El Chorro. Town council: Plaza Fuente Arriba s/n. - 29552- Alora. Official website: Ayuntamiento de Alora.